Munster Reds participation in the 2017 Hanley Energy Inter-Provincial T20 Trophy has been confirmed by Cricket Ireland at their Board meeting in Derry today. The decision is a welcome boost for cricket in the region, as outlined by Munster Chairman David Griffin: "We are naturally delighted that Munster Reds have got the green light to participate in the Hanley Energy T20 competition this season. 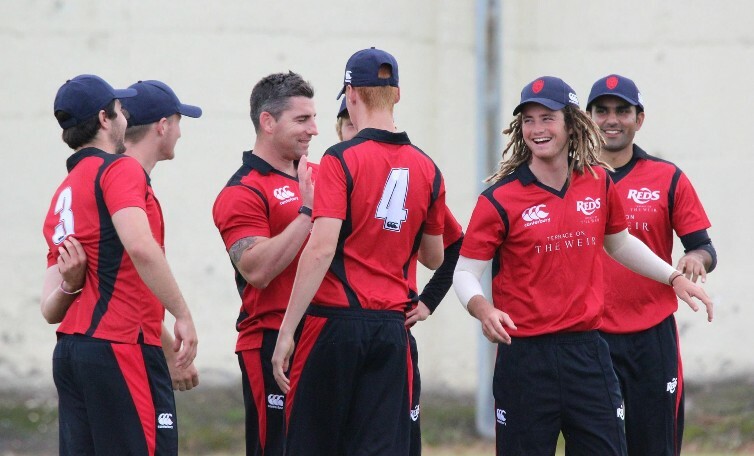 This is a major step forward in expanding the pathway for Munster players into representative cricket and to give them the opportunity to push their claims for inclusion in Irish squads. "It will also provide Munster Cricket with a huge opportunity to increase the profile of cricket across Munster and thus attract more players into the game at all levels" added Griffin. With just a few weeks left before the start of the season, preparation around the grounds has stepped up in the last while, and clubs learned who they would be facing first as the fixtures for the season were released. Massive credit must be given to fixtures secretary Joe O’Mahony for the huge work he has put in, juggling a number of different factors, with some obstacles put in for good measure, but we are delighted to announce that all the fixtures are live, and you can view them in the ‘Fixtures’ section on our website. The season kicks off on Saturday April 22nd with Cork Harlequins entertaining Limerick in the Premier Division, while there are two games in Division 2. On Sunday Division 2 sees another two opening weekend clashes, while the Premier closes its opening weekend with Midleton and County Galway hosting Cork County and County Kerry respectively. County Waterford has once again restored its contribution to the Munster leagues with not just one but two new clubs, as Lismore and Waterford and District join an already-eclectic Munster Division 2. It’s the result of over a year’s hard work by both clubs, securing facilities and getting teams together, with Waterford and District regular competitors in the Munster Minor Cup, despite not playing regular league action. It’s fantastic news for those in the Déise, and Munster Cricket would like to welcome both Lismore and Waterford and District back into the leagues, and look forward to their contribution in what is sure to be an absolutely cracking Division 2 this season. On the back of the success of the Munster Senior T20 competition, which has seen a regional round-robin format with the leaders qualifying for a finals day, and has proved a huge success with a strong attendance across all three days last year. That’s spawned a new Junior T20 competition for sides at the Junior grade, who in recent years have been struggling to get enough game time. The competition will start in mid-June as Limerick, Galway and Kerry face off in Adare, while County, Quins, and Tipperary will meet at the Mardkye, with the finals day taking place the day before the Senior counterpart. A once-in-a-lifetime opportunity for young Munster Reds development players Diarmuid Carey and Kassim Alam, as they will take a trip to visit the Marylebone Cricket Club academy at Lords, as part of an ever-improving tie between Munster Cricket and cricket’s most famous bastions. The opportunities in particular are thanks to Fraiser Stewart from the organisation, who saw first-hand the fantastic talent here in Munster last year, when an experimental Reds side, including many young players, beat the touring side in the Mardyke last August. The pair will make the relatively short trip to the famous ground on Tuesday 11th April, and will be kept up and given two days’ expert coaching by MCC’s staff, who have a wealth of knowledge and experience among them. It’s a fantastic chance for the boys to soak up as much as they can as they continue their development as cricketers, and also see first-hand the kind of work that’s required to become a top-class player. Munster Cricket would once again like to extend its many thanks for this generous offer afforded by the MCC, and hope that this opportunity will be given to more young Munster players, as the province continues to contribute to Irish national sides. We would also like to wish Diarmuid and Kassim the very best of luck, and hope they will have an informative and unforgettable experience at the home of cricket. The Cricket Committee has reviewed and updated the League and Cup Regulations for the 2017 season and these will be published on the website shortly. It is also planned to hold meetings with Club Captains to discuss the changes that have been made. In the meantime, the following summarises the main changes that apply. All matches will now commence at 12 noon. The minimum number of overs that constitute a match has been reduced from 20 to 10 per side. Division 1 will involve each team playing each other 3 times. In Division 2, the teams will play each other once and the league will then split into top and bottom sections for round robin playoffs. To reduce the number of unplayed and unfinished games, teams are expected to travel to the ground and remain until the cut off time is reached before calling off subject to the application of common sense in relation to ground and weather conditions. For safety reasons, players who are Under 11 at 1 September 2016 cannot participate in adult cricket matches in any capacity ( i.e. as players or umpires). Where applicable , DLS Version 2 must be used. Starring regulations will be based on ability with no exemptions on the grounds of age. The long-standing relationship between Munster Cricket and the MCC also continues on the field later on in the summer, as the MCC bring their side over for games in Cork, and this year will pay their first visit to the new clubhouse at the Oyster Oval in Kerry. The tourists are set to take on a Munster Development at the end of May, and are set to head down to the Oyster Oval later on in the summer, after two games against the Munster Reds in the Mardyke. The dates for these fixtures are outlined in below in our new ‘Dates for your diary’ section, and more information is set to follow closer to the dates. Munster Cricket are pleased to announce that Kevin Galvin has once again joined the Union to resume in his role as Administrative Assistant. Kevin began with the Union last summer, providing an administrative link between schools, clubs, and the Union across all levels of the game, and establishing the framework for Munster’s Interprovincial bid before his contract ended in October last year. He has been working pro-gratis for the Union in the off-season, combining that with a temporary contract with Munster Rugby’s communication department and freelancing for several newspapers, but thanks to funding from Cricket Ireland, the Union have been able to once again honour his contract from April until September. You can contact Kevin at his new email address, admin@munstercricket.ie. Munster Cricket have been working hard with the Irish Wheelchair Association in the promotion of an exciting sporting alternative for those with limited mobility, table cricket. Table Cricket was originally developed by Doug Williamson in 1990, through Project Adapted at Nottingham Trent University. It stemmed from the desire to devise another appropriate sporting opportunity for youngsters who could not take part in the traditional Paralympic sports. It was created especially for those with more severe physical impairments, and trials were conducted in Nottingham and at Stoke Mandeville. In 1998, the Youth Sport Trust adopted Table Cricket and added it to the Sportsability Bag of adapted equipment that was then distributed to 1,500 schools throughout England and Wales. The game involves a table tennis table, or similar surface area, side panels with sliding fielders, a ball launcher, a plastic ball and a wooden bat to simulate a game of cricket. Through the work of Jim Doran and Munster Cricket, it made debut its debut at the recent Cork SportsAbility Week 2017, with the showcase day on Saturday 25th March at the Mardyke Arena, where former Irish International goalkeeper Packie Bonner was in attendance. The action took place on Court 1 where a multitude of people across all ability levels had their first taste of the sport. Wednesday evening saw a Table Cricket taster, which began at 6.30pm at the Irish Wheelchair Association HQ in Blackrock and allowed those interested to further understand the new game. Munster Cricket is proud to be working with the Irish Wheelchair Association on this initiative, and look forward to further developing the game for people of mixed abilities into the future. Some exciting events on the horizon for Munster underage players, as they too begin preparations for their various competitions across 2017. The highly successful Senior Schools T20 will once again return, with last year’s finalists Cork Community College and Presentation Brothers College facing each other in the first game. Last year’s cup proved to be an extremely tight affair right down to the final match, and once again some of the best young cricketers in Munster will be involved. There will also be a Junior T20 game between old rivals CBC and PBC on Wednesday April 26th at 11am. Cork Harlequins will once again be the ones to beat as they defend their U14 league title, and we will have more news on that competition closer to the date, while Munster will look to cause more shocks in the Interprovincial competitions, scheduled later on in the summer. A fantastic opportunity will also be coming in the shape of a touring South African side, picked by the South African Cricket Association from select schools with players between the ages of 16 and 19. This side will take on a Munster development outfit in both Cork and Limerick in July. They will first visit Cork on the 7th and then Adare on the 10th, and more details will be announced closer to the date. Saturday 16th – Final day of Division 1.